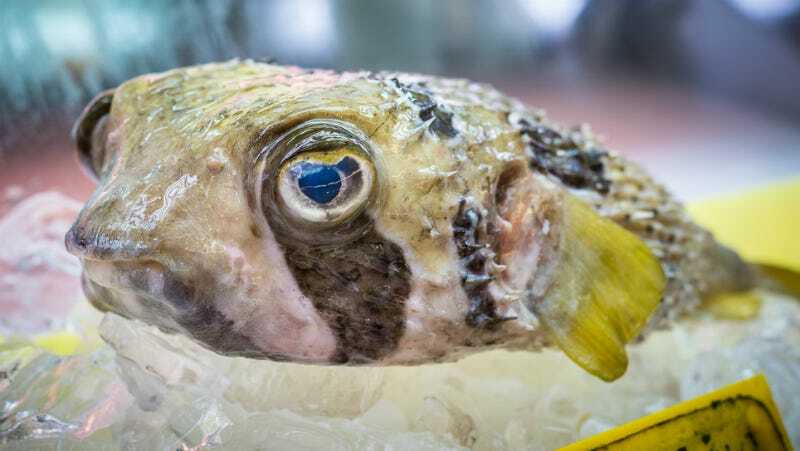 Fugu, the Japanese pufferfish that’s a luxe delicacy but also courses with neurotoxins more poisonous than cyanide, might help scientists gin up pain-killing drugs in the future. For killer pain, a killer fish might be the solution. A dish that’s as risky as it is fancy, fugu must be specially prepared by a licensed chef who knows exactly how to slice the deadly sea critter, and how to remove its toxin-packed liver, ovaries, and other hazardous innards. But on Wednesday, Japanese pharmaceutical company Astellas Pharma announced an initiative to make pain killers that work on your neurons the same way fugu poison does. Except, y’know, it’ll just kill your pain and not you. See, fugu are packed with tetrodotoxin, a lethal substance that National Geographic says is 1,200 times more deadly than cyanide, and one fugu is filled with enough of it to kill 30 adult humans. It does you in by blocking messages sent to your nerve cells, which leads to your vital organs shutting down. But, the Wall Street Journal reports that Astellas and other pharma companies want to copy how tetrodotoxin disrupts signals sent to your brain, but want to block pain messages only. Astellas will spend $15 million to work with New Jersey-based Chromocell Corp., a biotech company that’s researched NaV1.7, a sodium channel in our brains that, if blocked, could help treat severe pain—so long as we figure out how to avoid any harmful side effects. WSJ points out that scientists have been harnessing poison for beneficial purposes for years. (Hello, botox.) Even researching how to possibly use fugu poison as a pain killer has been pursued before—as far back as 2003 in Canada.